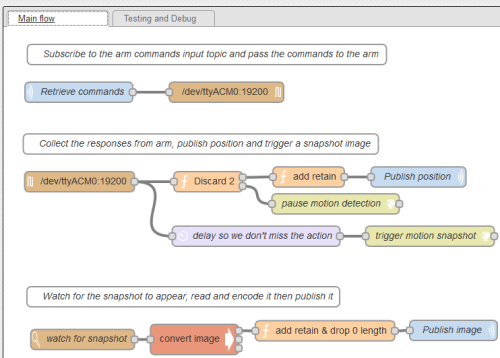 I haven’t really documented the Node-RED flow used for the robot arm anywhere, so this post will try to rectify that. Node-RED is run on a Raspberry Pi and used as the hub in the process of controlling the robot arm from a client either ‘web’ or Scratch. Node-RED starts at boot time and co-ordinates the flow of data to and from the MessageSight broker and the Arduino that is connected to a Pi USB port. The main part of the flow is shown below, each of the nodes will be explained. 3 comment blocks in the flow allow for some basic documentation within Node-RED itself. Output from the MQTT node is passed directly to a ‘serial out’ node that is connected to /dev/tty/ACM0. This is the where the Arduino serial interface appears. The Arduino takes the command and actions it as described in the previous post. Next we have a ‘serial in’ node also connected to /dev/tty/ACM0, this receives all of the responses back from the Arduino. The flow splits here. The ‘Discard 2’ function node contains the following code and the comments explain its reason for existing. For output one another function node just sets the msg.retain=true so that the last position reported will always be available to clients, then it is on to an ‘mqtt out’ node to publish the position status to the <stem>/output topic. As explained in the code the one message that is sent to output 2 flows into an ‘http request’ node. The URL http://localhost:8080/0/detection/pause ‘pauses’ the motion detection function of the motion program that was started at boot time. Motion detection is always active from boot and must be paused if it is not required. In this application, only snapshots are used. It is the other output out of the ‘serial in’ node that is used to ‘trigger motion snapshot’. It is another ‘http request’ node with a URL of http://localhost:8080/0/action/snapshot this tells motion to write the last image it took to disk as a jpg file. Motion has been configured to take images at 15 frames a second so the last image could be up to 66ms old and we could miss the event we were trying to capture. This is why there is a ‘delay so we don’t miss the action’ delay node set at 0.1 seconds to wait and ensure the event has occurred before we take the snapshot. At this point we’ve only caused a snapshot jpg to be written to ‘disk’ (SD card in this case on a Raspberry Pi) So the last part of the flow has to retrieve and publish it. ‘watch for snapshot’ is a ‘watch’ node that uses fs.notify under the covers to keep an eye on a certain directory, where the snapshots are written, and report a change in the directory. There was an initial problem here, as motion wrote the jpg file to a directory, more than one change was seen and sent through the flow for each file. This was overcome by using a small ‘on_picture_save’ shell script within the motion configuration file. Each time a jpg is saved this script is called with the file name as a parameter. This script symlinks the image into another directory waits 10 seconds and then deletes the original and the symlink. We assume that the file has been read and published before the 10 seconds is up. This means we keep the disk clean and don’t accumulate lots of images or symlinks. (Each snapshot image has a date, time and frame stamped name). ‘convert image’ is an exec node which calls a python script when it is told a change has occurred in the symlink directory. The watch node also reports on file deletes as well as creates so this script checks if the file exists when it is called. If the file doesn’t exist any more then it must have been a delete. If it can be read it is, into an string and then encoded into base64 before being printed onto stdout. Finally the image is published to the <stem>/image topic through an mqtt node.